Canvas banners and canvas prints are an excellent choice for higher-end indoor and outdoor displays and signs, such as wall murals, art reproduction prints on canvas, art giclee prints, backdrops, and photos on canvas. Depending on the application, we offer a couple different types of canvas materials to choose from for your canvas print. You can also choose from solvent-based printing or dye sublimation printing unless otherwise stated. Our solvotex canvas material is a nice, lightweight canvas that lets a little bit of light through. Solvotex produces rich, bright colors and is perfect for indoor canvas prints, art reproduction work, indoor wall murals, and photos printed on canvas. Our solvent-based solvotex banners are available up to 16' wide x any length in a single piece, and our dye-sublimation solvotex banners are available up to 10' wide x any length in a single piece. 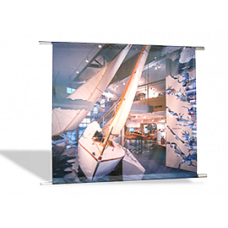 Multiple prints can be sewn together for even larger canvas banners and displays. Artex is a heavier canvas material that does reflect light and doesn't allow light to pass through. Artex canvas is made up of 50% canvas and 50% vinyl. Therefore, it has the premium look and feel of canvas, but can also be used outdoors like vinyl. Artex is ideal for TV or photography backdrops on canvas, photos on canvas, art reproduction, and large format outdoor displays where canvas is desired. Because Artex contains vinyl, only solvent-based printing is available on this material. Our premium canvas banners can be finished with grommets, hemmed edges, reinforced webbing, and pole pockets, depending on how and where you need to hang the banners. The prices for each option are shown in the table above. If you are unsure of what type of finishing would work best for you, please visit our banner finishing page for more information or contact one our account executives for help. If you are ready to order your premium mesh banners, please fill out our mesh banner order form or contact one of our account specialists today! Our no light backdrop banners are non-reflective banners printed in full-color on a no-light fabric ..